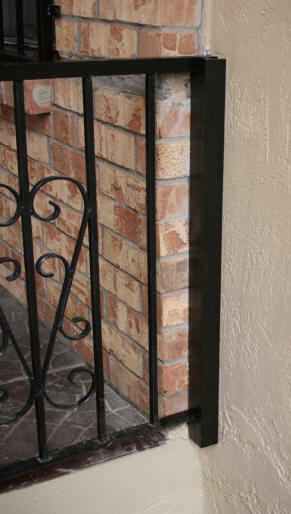 The wrought iron that separates the front entrance and the stucco wall patio area, has always bothered me. The main thing is how the iron is attached to the wall. On the walls, it is just two bolts on each side. The bolts are secure and everything is solid, no wiggling. But to me, and maybe it is just me, it just looks flimsy. I want to make a cover for the bolts that will make it "look" more solid. 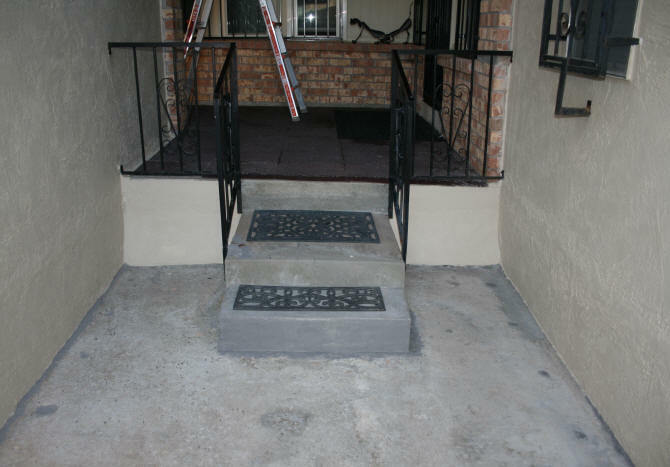 I also don't like how the bottom part of the stair newels are attached to the concrete stairs. The metal in this area was just repaired last year because it had rusted out. I had sanded and painted it and the rust is starting again because this area gets hit with rain water. I want to cover this to make it look sturdier and protect the metal from the rain. My plan is to make faux newels that covers the wall bolts. For the newels at the end of the stairs, the same thing, faux posts. 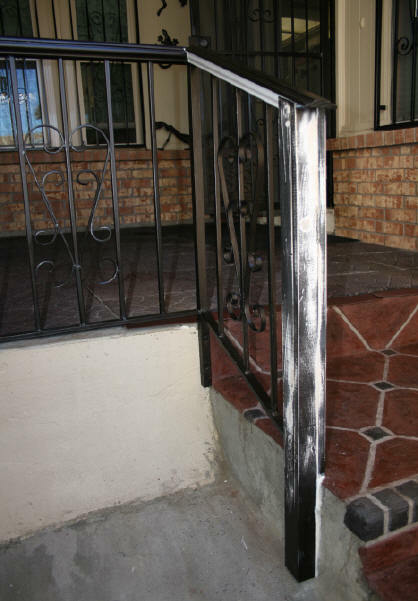 I also want to add a wood handrail painted black to the top of the wrought iron so it matches the wrought iron handrails inside the house. 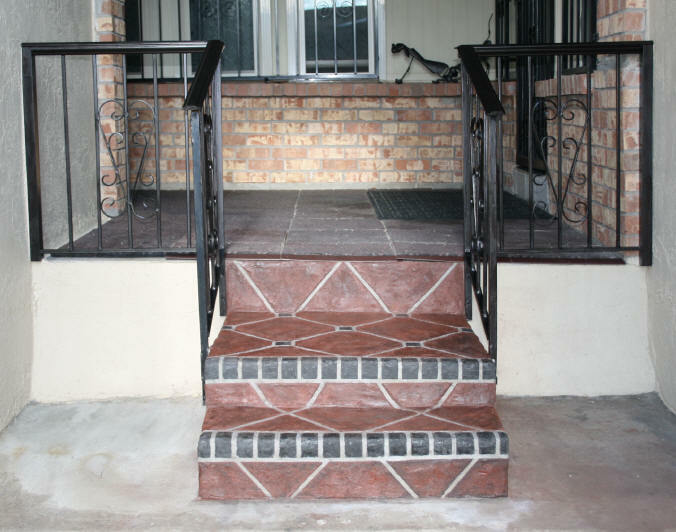 The ugly stairs will have a faux tile finish that I will cover on a separate page. I need to hit the hardware store to look for a weatherproof material to make my faux posts. August 26 - 29, 2014 - The size of materials I found that worked for the faux newels against the wall was 1-3/4" x 3/4" wood moulding and some pvc lattice moulding. The wood moulding will be cut to fit on the inside of the rail and the two pvc lattice pieces attached to the wood with glue. 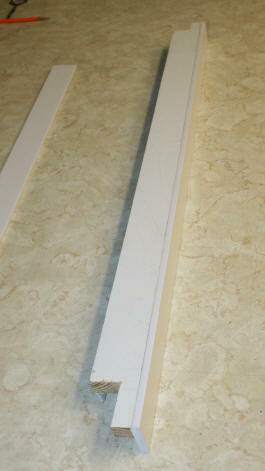 After cutting the wood moulding to fit, I glued one side of the pvc onto the wood and let it sit to dry. 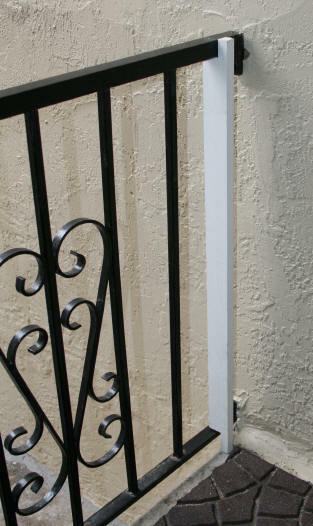 I needed to attach the second piece of pvc in place on the wrought iron. After the glue dried, I spray painted the pieces. In the meantime, I had to chip out some concrete where the bottom of this faux newel will be so it would lay flush in the corner and as close to the wall as possible. One thing I discovered about this wall....it had a concave curve between the two mounting bolts. 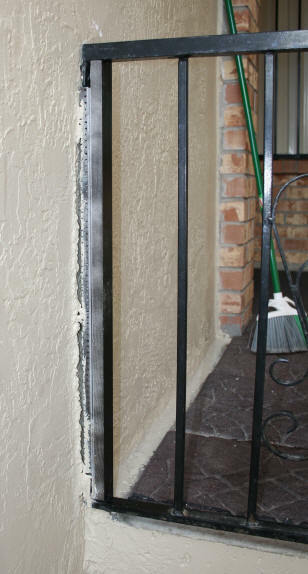 Since my goal was to make the area inside the faux newel water tight, a big huge gap along the side would not do. The gap was also too large to place some caulk in. 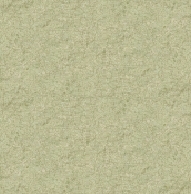 What I ended up doing was build up a area of texture on the wall, so the texture would meet with the edge of the faux newel. I used some DAP Vinyl Concrete Patch I had laying around to do this. I just dabbed clumps of the mixture on until I got the height I wanted. Yes, it took a while. I fitted the two glued pieces of the faux newel in place to make sure the texture was high enough. I also patched in areas at the bottom of the concrete that I had chipped away to make room for the faux newel. 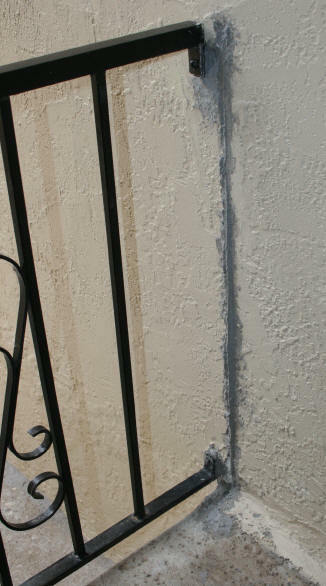 After letting the patch material dry on the wall, I painted the area with my stucco paint. After the stucco paint dried I placed the two glued pieces of the faux newel in place after putting a bead of silicone sealant along the edge of the pvc and the wall. After the piece had dried in place, I added some more silicone caulk along the outside of the edge. I also needed to again add texture to the wall and paint it on the back side before the third and final piece of pvc lattice moulding could be glued in place. 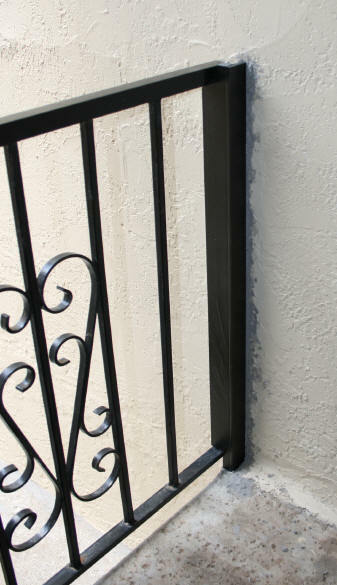 With this faux newel in place I worked on the other side of the wrought iron. 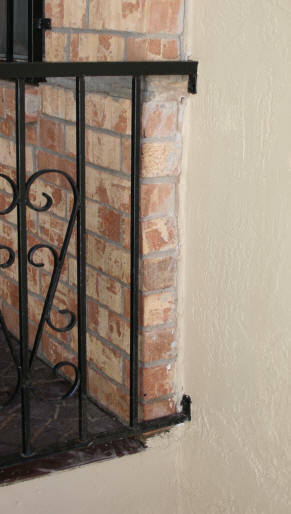 Because of the brick along this wall, I only needed two pieces to make my faux newel. One piece of the same wood moulding, and one piece of pvc lattice. The wall was not concave on this side so the faux newel was almost flush with the wall. I did place some clear silicone sealant along the edges to keep out water. This faux newel is pictured below. At this point, both faux newels are open at the top and bottom. I did add a little scrap piece of wood at both bottoms to make it look square. I should have just cut a gap in the wood instead of taking off the whole corner. I was not too worried about this because it is hidden at the bottom and not too noticeable unless you are looking for it. The top of the faux newels will be covered with the handrail. The bottom will be left open to allow drainage of water in case any gets in side, which is unlikely at this point with all the silicone I used. The next thing to deal with was the handrail. Here I ran into big problems. 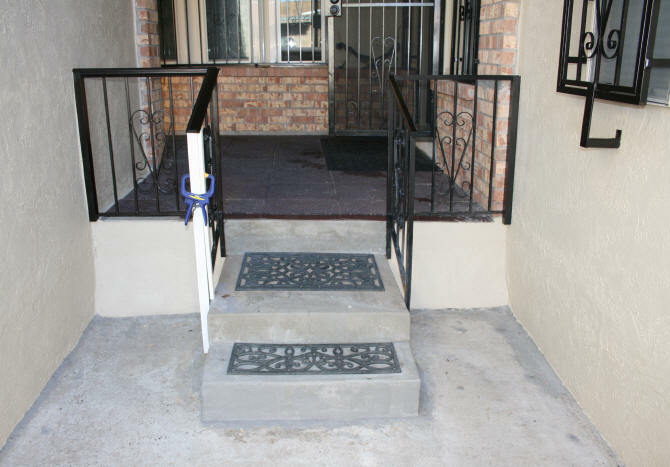 I spent a couple of days on the internet looking for just the right handrail for this project. I was hoping to find a low profile wood or metal handrail with a 1" wide plow so it would fit nicely on top of my rail. 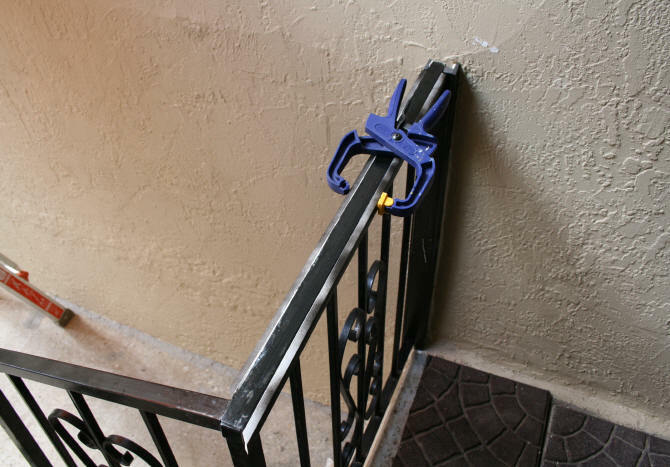 I did find handrails online with 1-1/4" plows which would have worked, but the shipping was more than the cost of the rail. The local hardware stores only had huge handrails that were too big. 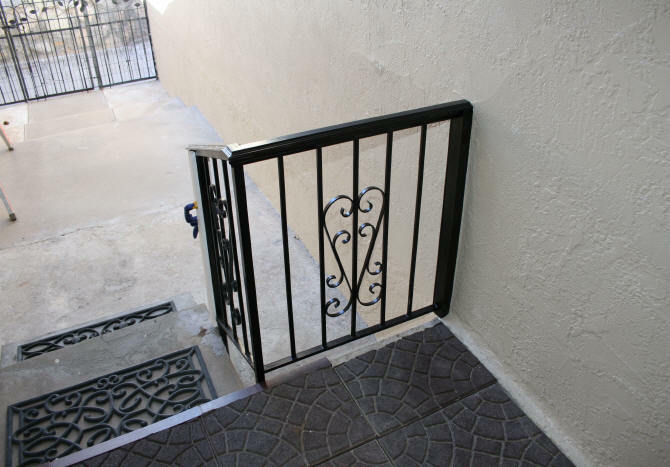 Companies that make vinyl fencing systems only had 4" wide handrails which were too wide for my project. 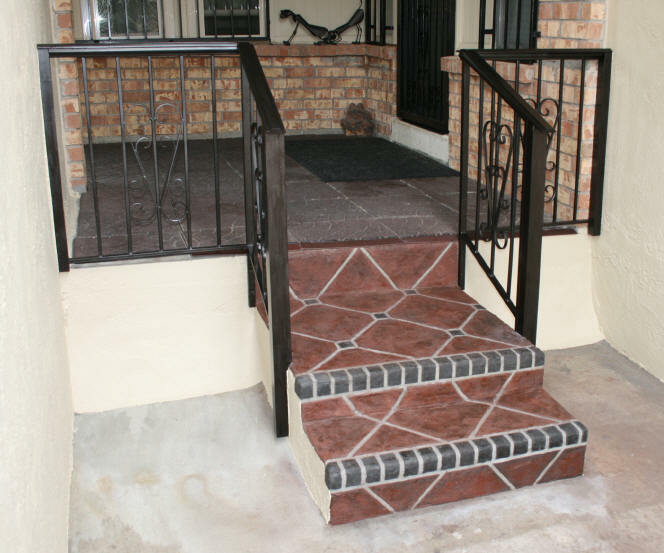 I basically hit a dead end looking specifically for a handrail ideal for this project. Chair rail moulding I then came up with the idea of adding moulding instead, that would "look" like a handrail. I ended up purchasing some wood chair rail moulding and some cap stop polystyrene moulding for underneath the chair rail. For the non-stair top rail I cut and spray painted the cap stop moulding. The cuts are mitered on the outside and inside corners. The cap stop moulding along the top stair rail section will be added last. On the top of the rail, I added the chair rail. I admit, it took me a while to figure out how to do the corner. It takes three separate pieces. The first has the one mitered cut. 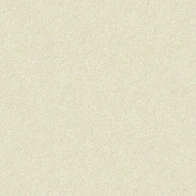 The second piece is mitered like you are going around a corner on say, a door frame. 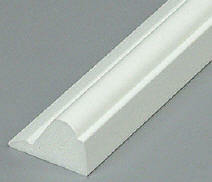 The last piece of moulding going down the stair rail was an angled cut at 20 degrees. See photo below. After sanding the glued joints and painting, the handrail came out pretty decent looking. 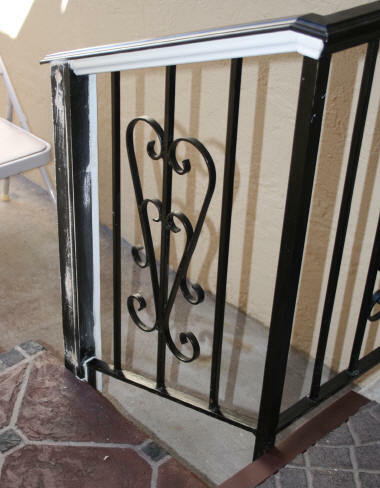 I attached the chair rail to the wrought iron with Liquid Nails. I then caulked the joint between the cap stop moulding and the chair rail moulding to make it appear seamless underneath after painting. The work so far showing completed newels against walls and hand rail on left. I am still working on the newel covers at the end of the stairs. Because of the uneven surface on the wrought iron newel, I had to carve out chunks of wood on the inside so the wood moulding would lay flat against the wrought iron. 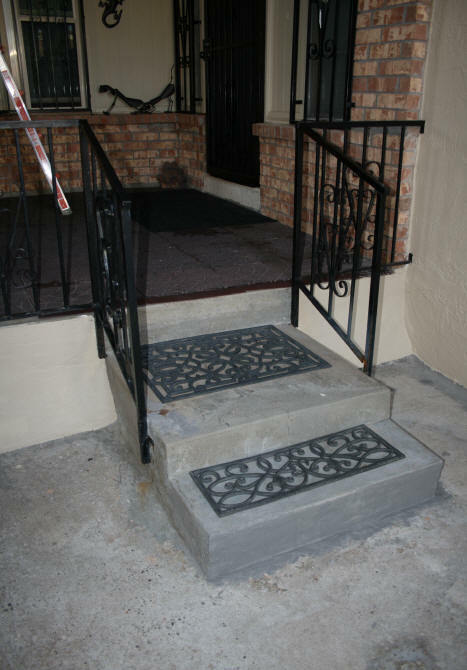 Also, because of the resurfacing I am going to do on these stairs, I will need to do the work on the stairs before I actually attach the newel covers at the end of the stairs. 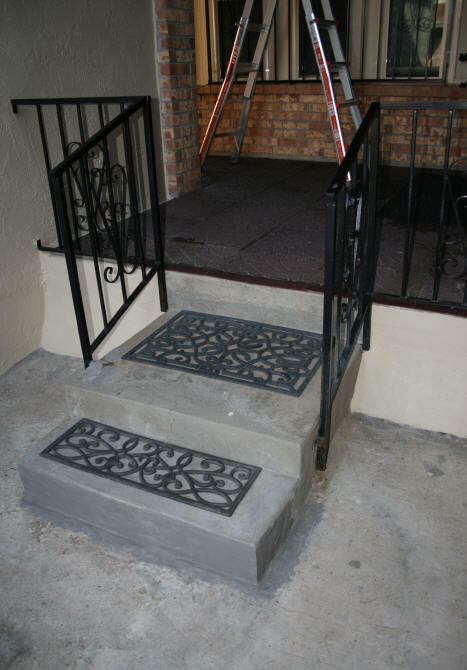 September 9 - 11, 2014 - Now that I finished the faux treatment on the stairs I was ready to return to the wrought iron. stairs newel cover For the newel covers, I used the 1-3/4" x 3/4" moulding. 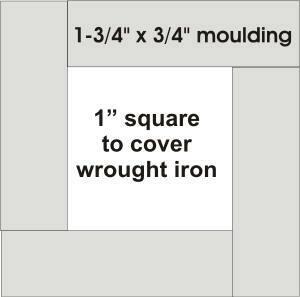 I found that when I placed four pieces in a square, I had exactly 1" square on the inside, which is the size of this wrought iron. I did have to make 20 degree cuts on the ends so it would fit underneath the stair handrail. I extended the length of the newel covers to almost touch the ground. I stopped at about one inch from the ground. Even though I was sealing the newel covers everywhere except the bottom, I wanted it to be able to drain, just incase any water did get inside. I was able to glue the outside and front pieces of the newel cover together first on a flat surface with wood glue. The third and fourth pieces had to be glued on in place on the newel. Everything was attached to the wrought iron with Liquid Nails. I used clamps to hold the pieces in place while the adhesive set. I then needed to re-sand the wood because my clamps pulled off some of my spray paint. After the newels were in place I cut the final pieces of the cap stop moulding for under the stair handrails. 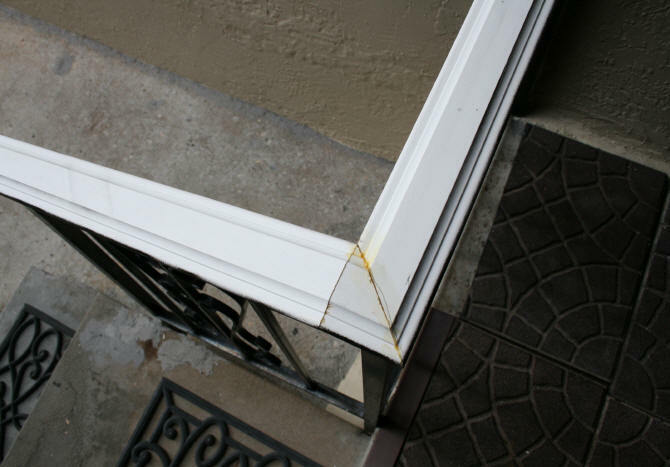 Caulk was used to seal any cracks in the moulding, along the newel cover and cement stairs, and between the handrail and the cap stop moulding. Each piece of the moulding needed to be custom fit to go around the wrought iron. One newel in place, sanded down, and seams caulked. Underneath the bottom rail of the stairs a small piece of moulding was cut to fit under the bottom rail and against the cement stairs to close the newel cover. Some of you may be asking...What about the center newel? I may go back later and add a cover to them. For now, I will leave the center wrought iron newels as it is. 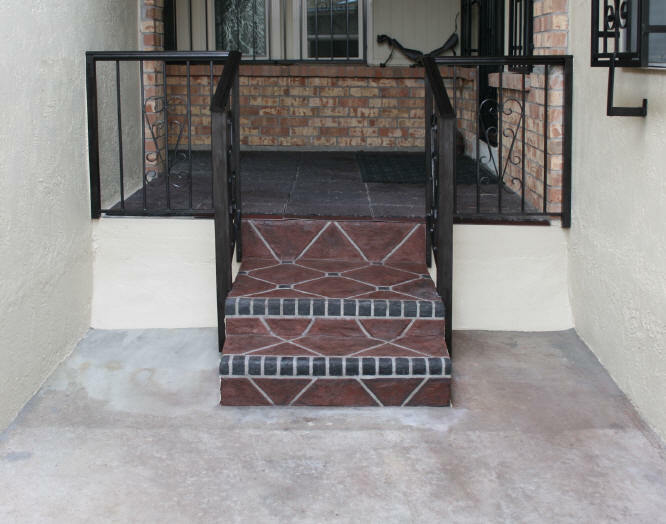 I then painted the newel covers and moulding and painted the side of the stairs with the same paint I used on the stucco walls. 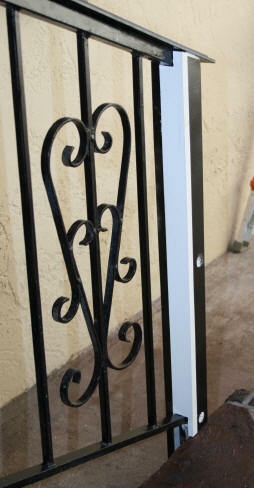 I plan to add some of the same type of additions to some wrought iron gates this house has. When I do, I will add the upgrades to this page. 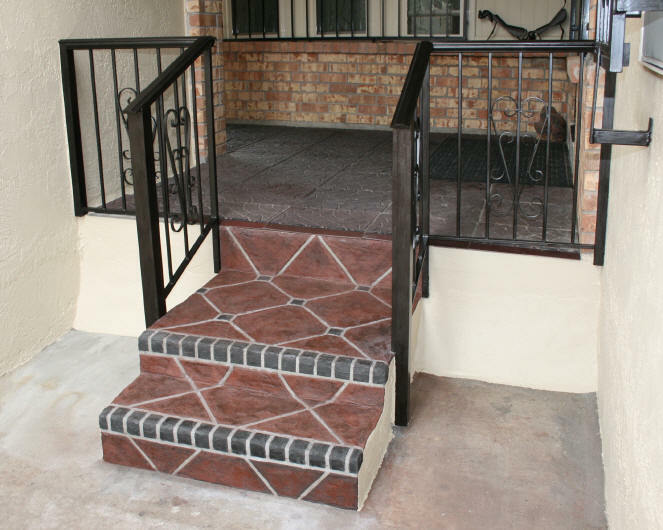 As for the rest of this patio, I plan to do the same type of treatment I did on the stairs. Probably in 2015.